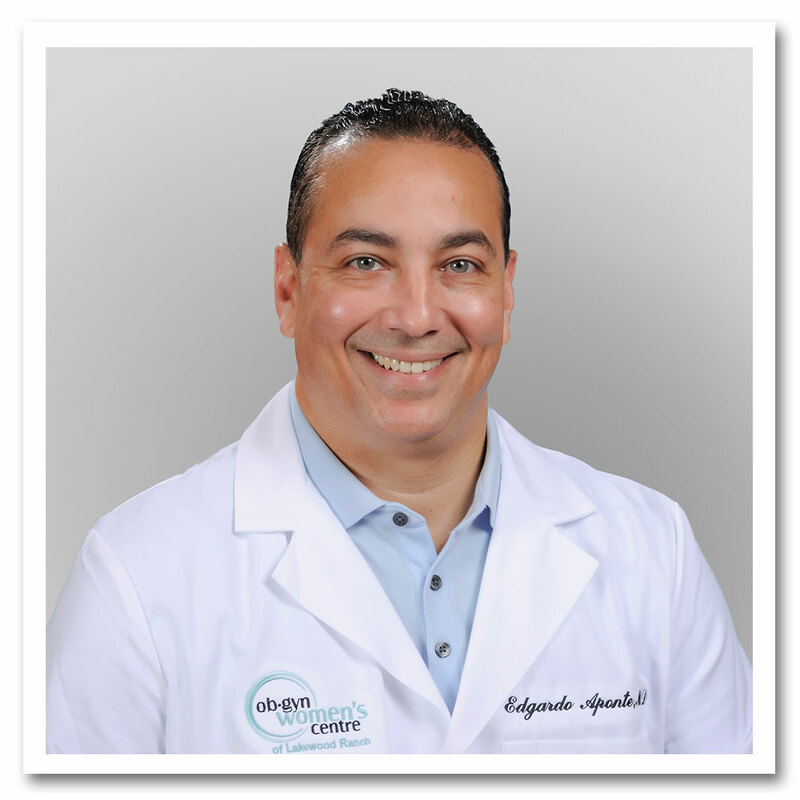 Doctor Edgardo Aponte is one of our three skilled physicians at the OB-GYN Women’s Centre of Lakewood Ranch. With over two decades of gynecological and surgical experience, Dr. Aponte has developed a passion for women’s healthcare that has allowed him to help women for years. A Puerto Rico native, Dr. Aponte grew up in Coamo, a town founded in 1579. It was in this town that he developed a passion for science and helping others, making medicine his ideal field. Dr. Aponte received his Medical Doctor degree from the University of Puerto Rico’s Medical Program in San Juan and went on to complete his residency at the University Hospital. After medical school, Dr. Aponte went on to work in private practices in Carolina and San Juan, PR. He also spent his time as assistant professor at the San Juan City Hospital OB-GYN residency program. He also took up a leadership role as the Chairman of the OB-GYN department at the Ashford Presbyterian Community Hospital in San Juan, PR. In 2012 Dr. Aponte joined OB-GYN Women’s Centre of Lakewood Ranch. Today, Dr. Aponte specializes in a number of women’s health issues. He loves the surgical aspect of gynecology and has a passion for healing through surgery. Dr. Aponte performs a number of minimally invasive gynecological surgeries, as well as pelvic organ prolapsed surgery and incontinence surgery. Dr. Aponte also loves the obstetrics side of his profession and believes there is no greater joy than helping women on their journey to motherhood. What Dr. Aponte loves most about his job is his ability to offer women professional and compassionate care. He, along with our entire team, treats every patient with the respect and care they deserve. Dr. Aponte says his goal is to make a positive change in the way women live their lives though the gynecological care he provides. In his spare time, Dr. Aponte spends his time being active. He enjoys playing golf, running and biking. He also loves spending time with his twin daughters. To make an appointment with Dr. Aponte, visit our patient request form, or give us a call at (941) 254-2717. We can’t wait to hear from you!